I wish yous all a very Happy New Year and for it to be filled with joy and happiness. 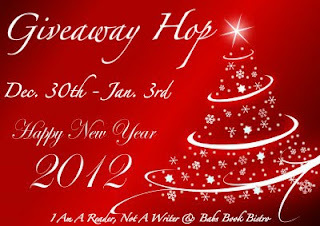 Thanks to I am a reader not a writer & Babs Book Bistro for hosting! To Enter you must be a GFC follower it is as simple as that! Comment below with your email address so you can be contacted if you win. Check out the other awesome blogs particapting in this hop! Thanks for the awesome giveaway! Happy New Year! thanks for the giveaway, happy new year! I read the book Black Beauty a long time ago and I'm in love with the movie, It's so beautiful I love it so much!!! Tough choice-I would like to read all three as the movies are wonderful. Oh wow...those are really good books too!!!! Thanks for the giveaway!I love classics! Happy New Year! Thanks for the chance to win! Great books to choose from! Thnks for the giveaway !!! Oh wow! Such great books! I remember my mum reading The Secret Garden to me when I was really young. I've read it again since but my copy's still at my parents' house in France. It's one made specially for children so it has big glossy pictures in it - love it! And Black Beauty is one of my favourite books ever. My copy is so well-loved that it's got to the point where it's falling apart. Love both books! ooh, i love those books ^^ would be happy to win any of them. Thanks for the great giveaway. I have not read The Secret Garden. I would choose The Secret Garden. Thanks you for this giveaway! Thanks for the giveaway. I love all three of those book. Black Beauty is my choice. I'm a GFC follower. Thank you for the giveaway and Happy New Year! Thanks for the giveaway! Those a great books! I would like The Secret Garden please!